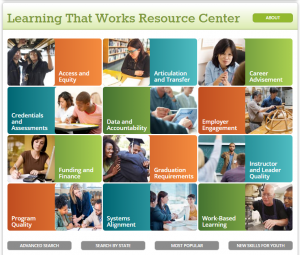 Check out the new Learning that Works Resource Center! Advance CTE is excited to announce the launch of the Learning that Works Resource Center! This directory is your destination for high-quality materials focused on Career Technical Education (CTE) and career readiness. In this Resource Center, youâ€™ll find the reports, guides, tools and analyses of state policies you needÂ to support the development and implementation of high-quality CTE and career readiness programs and policies across and within states. The Resource Center was developed through the New Skills for Youth initiative, a partnership of the Council of Chief State School Officers, Advance CTE and the Education Strategy Group, generously funded by JPMorgan Chase & Co. Tools and case studies developed by the partners and other organizations will be added to the Resource Center regularly. The Resource Center lets your search in a variety of ways. If you’re interested in a specific issue, like data and accountability, you can find all relevant materials sorted topically. If youâ€™re looking for resourcesÂ toÂ help you roll up your sleeves and focus on implementation, check out the guides and tools. Â You can also find tools created specifically for New Skills for Youth. Finally, the Resource Center can help you learn about some promising policies from across the country, like Tennesseeâ€™s recent standards revision process. Learn more about the Resource Center. Have a resource that should be included? Submit it here. This entry was posted on Tuesday, June 21st, 2016 at 9:48 am	and is filed under Advance CTE Announcements, Advance CTE Resources, Research, Resources. You can follow any responses to this entry through the RSS 2.0 feed. Both comments and pings are currently closed.